After celebrating its second birthday, it would be a great understatement to say that the Nintendo Switch has been a success. With over 30 million units sold and what is now a series defining Nintendo first party library later, it seems an ideal opportunity to review this mature hybrid design concept in 2019. Without doubt the Nintendo Switch is our favourite console design of this generation. A clean and tactile tablet-like shape similar to the Amazon Fire 7 is made characterful by the Joy Con controllers in the same way older Nintendo console releases were. In fact, that’s not the only thing older Nintendo consoles have in common with the Switch, as after 18 years Nintendo are back to using cartridge based media in their home consoles. A little like a slimmer 3DS cartridge in size, they load under a flap at the top of the system next to the headphone jack - with volume and power buttons residing on the left side. This means no installs and insignificant load times; although if you prefer digital versions of your games, the Nintendo eShop offers them. Differences in pricing have so far meant physical media is still preferable for us. A kickstand pulls out from behind the unit to reveal a micro SD card slot to compliment the 32GB internal flash storage. Although a well intended idea, the kickstand can only be relied upon on truly flat surfaces as we found out the hard way! However, sat down at the kitchen table, we’ll slide the Joy Cons off for a quick two player Mario Kart 8 session and the kickstand is then appreciated. One of the first things we did when we got our Switch was to play the HD YouTube video Arctic - Visual Vibes by Ben Brown simultaneously against an iPhone X. Distinctly the Switch 6.2” 720P IPS touch screen is remarkably similar in quality and proves a completely different beast to those found in the Nintendo 3DS system. This screen has superb viewing angles, serious colour gamut, deep blacks and brightness levels that make outdoor visibility easier. Nintendo have really understood what it takes to make an enjoyable viewing experience that can hold itself up against great HD tablet displays with distinction. Not to neglect mentioning the stereo inbuilt speakers that output a surprising amount of volume; and the overall quality of sound is passable too when on the move without wired headphones. This neatly brings us onto some sore points regarding the hardware, the biggest being the lack of headphone Bluetooth ability use out of the box. Whist Nintendo have tried to get round this by adding support for wireless headphones via a USB adapter, it seems a tad unrefined in 2019. There’s also the nagging truth that the Switch display is plastic coated and not glass which makes it more vulnerable to scratch but less likely to crack. Nintendo have a rich history of controller designs, to put it lightly. But a modular concept is certainly Nintendo’s latest lightbulb moment and ties a lot of their previous hardware efforts together. 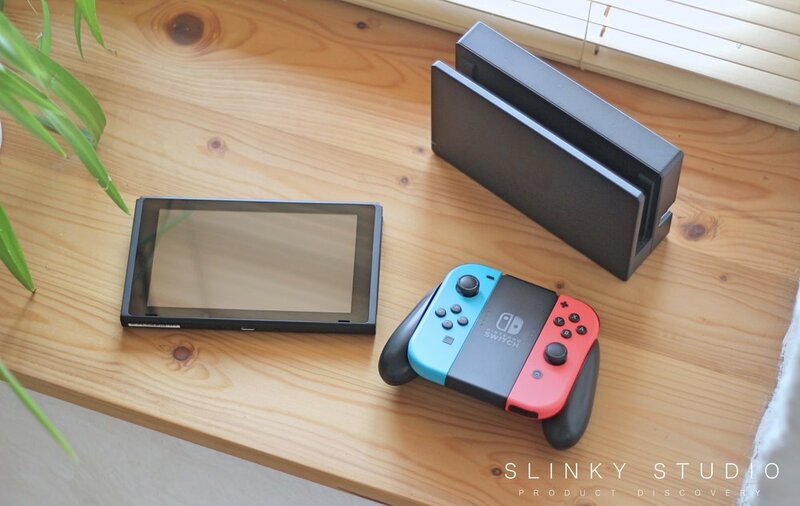 Each Joy Con features a 20hr battery life, a gyroscope and an accelerometer for Wii Motion Plus level independent left and right motion control. Also taking cues from the NES controller, you can snap them apart for two player gaming, where missing trigger buttons move to two hidden away on the rail where the Joy Con grips can be attached to make the shoulder buttons more prominent. On top of this the right Joy Con has an IR motion camera and an NFC touchpoint for amiibo. Not to neglect mention of HD rumble; which on face value reads gimmick but in practice undoubtedly involves gameplay with more vibration than any controller we’ve used before. The extent of this function is persuasively felt through the reality of rolling balls that are countable inside the controller and the revelation of hidden under floor moon locations in Super Mario Odyssey. 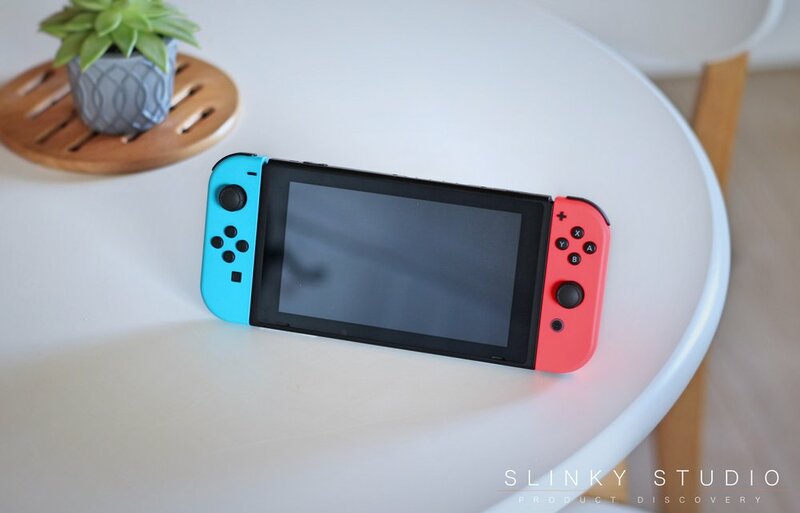 We’ve got the now flagship, and probably future classic, blue and red Joy Con controllers, but since the system's release a whole rainbow of colour and style options have been unveiled. Interesting to note that the Switch system itself has so far resisted changing its black attire. One in each hand: Equipping a Joy Con in each hand is generally the most enjoyable and comfortably free playing style when docked. Just as the Wii Remote and Nunchuck liberated players offering a totally transformative way to play, the Joy Con controllers heighten this by being ergonomically nimble in hand and there’s no trailing cable between the two. Buttons and joysticks are smaller than those on the PS4 or Xbox One controllers, but this doesn’t really matter as the surface buttons are responsively clicky and adequately spaced. The shoulder buttons are agreeably tactile to press and the joy sticks are silky smooth. Oddly the D-pad is a Nintendo first as it’s not one single piece of plastic anymore, which we assume is done for the snap apart styled two-player functionality. Controller Grip: This playing style is achieved when connecting the Joy Cons alongside each other into the supplied plastic grip. It comes into its own with technically challenging gameplay, such as occurs in the Darker Side Kingdom in Super Mario Odyssey and more frequently with Mario Kart 8 Deluxe. We’d agree that this squarish pad presents itself like it shouldn’t be all that comfortable, but actually when used for prolonged periods it’s perfectly enjoyable. Our only critique would be that during longer times of usage the narrowness between the two Joy Cons can get fidgety and probably an extra centimetre would have resolved this. To put it into context with these playing styles, the Joy Cons don’t actually come with much in the way of compromise. If you do desire larger instruments Nintendo offer the Pro Controller that we’ve not yet felt any necessity to try. Handheld: This is having the Joy Cons attached to the Switch itself for handheld gaming: which incidentally is how we play our Switch most often. The last and only singular widescreen Nintendo handheld system was the GameBoy Advance, yet the Switch in handheld mode is far more reminiscent to holding the PSP and that’s definitely a good thing. The scaled down size of all the button controls is crystal clear when playing like this. Fingers don’t feel over-reached and your hands will appreciate the smooth edges and insignificant weight of 400g with the Joy Cons attached. It’s fundamentally the most compelling handheld experience of any console to date and that doesn’t come as much of a surprise as it’s Nintendo. What’s really unusual is none of the controller methods are exclusive to either playing in handheld or docked modes; although it’s obviously harder to waggle your arms around if on a packed train in the morning. . . Importantly, though, the ability to throw Mario’s hat up in the air is possible in any of the modes! In real world terms, playing demanding titles such as Super Mario Odyssey, with brightness turned up almost all the way, will see the battery carry the system for 3 hours, whereas with less demanding titles, graphically speaking, the battery can squeeze up to 6 hours out. The first figure measures the same stamina as our 3DS XL, and when you consider that the Switch is playing home console quality titles on the go, that’s quite an achievement. A bundled dock is often an overlooked inclusion with products like the original iPhone and various games consoles, but here it’s imperative to be able to play games on a TV screen and thankfully it’s a simple piece of design. 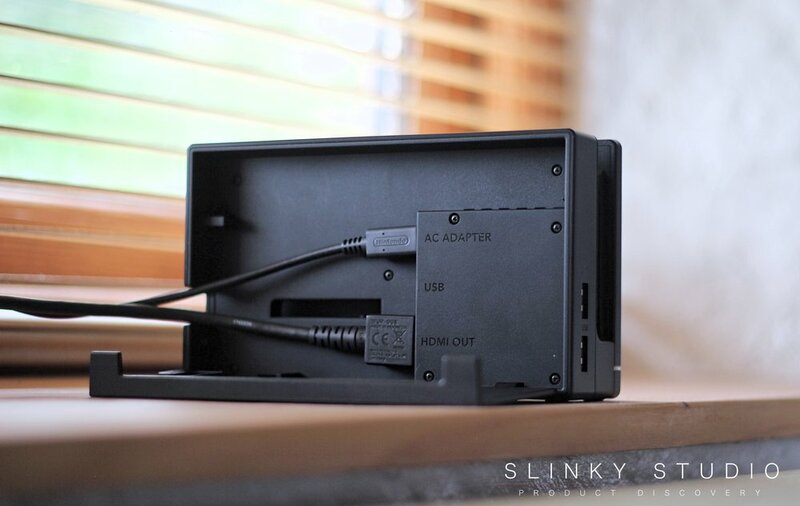 The dock includes cable management via a door which neatly tucks away the entry of the AC USB Type-C power cable and the HDMI Cable to be plugged into your TV (both included in the box). Placing the Switch into the dock is simple thanks to rails that guide the charging port into place, so you don’t need to fiddle as is the case with so many phone and tablet docks. Removing the Joy Con controllers in the expert one go manner presented in Nintendo’s commercials is certainly a little trickier and a game in itself. Yet our lacklustre technique is redeemed when sliding them onto the Switch screen to hear a satisfying analogue and digital click! Understandably, due to the size of the dock it can sit on TV stands, and ours frequently moves location to greet other displays because it’s so portable. The Switch is powered by the Nvidia Tegra X1, making it Nintendo’s most powerful home and handheld console to date. When you factor in the skinny form factor that is able to churn out graphical performances which actually look comparable to both the PS4 and Xbox One, it’s significant. Certainly graphics are not the be all or end all that make a great experience, but without the scale of graphic capability Nintendo have utilised within the Switch, the sheer level of greatness demonstrated by their first party titles, such as the phenomenal visual gem that is Mario Odyssey and the expansive awe within The Legend of Zelda Breath of the Wild, would never have been so special. At the same time third party developers are finally understanding the Switch, with Wolfenstein II, Resident Evil Revelations and Rockstar Games detective title LA Noire receiving impressive updated visuals - and we’re still hoping GTA makes it across! What is the difference between playing docked vs handheld? The simple answer, and admittedly to our disbelief, it is very minimal from an observational perspective. Technically speaking the Switch dials its hardware down when playing in handheld mode to preserve battery life. Nintendo know full well that pushing the system to max settings would be a waste because the Switch display is significantly smaller and lower resolution than our 1080P TV, therefore demanding a significantly lower resolution at 720P means it avoids any obvious distinguishable difference; and that makes the home console experience on the go a factual statement and not a compromised one. Take Mario Odyssey as an example; certain textures appear slightly more detailed when docked and that’s really the only evident variable. The brutal truth for companies like Nintendo, Sony and Microsoft is that the future of a dedicated gaming console which presides in the living room has become a hard sell due to the potential of smartphone integration and devices like the Amazon Fire leveraging in power and ambition. Now that the future looks certain not to exist as a standalone device, Nintendo have debuted the best of both worlds in one single entity and it makes our PS4 feel a bit limited. This is without question Nintendo’s cleanest, fastest and easy to navigate user interface. The whole thing just flows with well thought out transitions to get you everywhere instantly, and the Switch earns the title as the fastest system of this generation to wake from sleep with no hesitation and take you straight back into a game. Furthermore, user accounts have been perfected and system settings are straight to the point. Multitasking is sort of possible - a bit like it is on the 3DS. You can launch a game and then hop into the home menu to adjust settings and the like; but we can’t launch, say YouTube, whilst a game is also running, as the Switch doesn’t make a distinction between lighter App-like software and games, something the PS4 does very well. One thing to surprise is that there isn’t currently any folder organisation ability, which seems likely to be on the way via an update with everyone's libraries quickly growing. In terms of the eShop, it’s also well presented and makes downloading games simple. So far though, Nintendo has resisted making the Switch a true tablet, with the absence of a web browser, catch up TV services or tablet-like Apps offered in the eShop (with the exception of YouTube). The Switch can, of course, do all of this, it’s just a question of when - and Nintendo are giving indication that the Switch will eventually blossom into a media hub in some form. New ideas and real innovations are bubbling out of the Switch, both from the hardware and its series defining game titles. The modular Joy Con controllers are the essential ingredient to its design, uniting the top notch hardware within the console as a persuasive at home experience that’s equally as compelling on the move. We think that the Nintendo Switch will boldly influence how the next generation of game consoles will look and function.